Hardcover, 470 pages, Henry Holt and Co. It took me over a year and a half to read The Kiss of Deception after its release date. In fact, I don’t think I even bought a copy of it until almost a year after it came out. 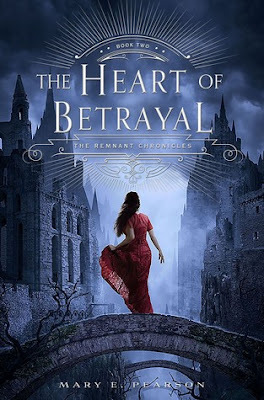 While I am happy about my procrastination, simply because I now get to read the entire trilogy in a year-span of time, I can’t believe I waited so long to read both the first book and The Heart of Betrayal. As you can see, though, I failed to wait just one short month until The Beauty of Darkness releases to finally read book two. The Heart of Betrayal starts out right where KoD left off. There’s a huge amount of anticipation as to what’s going to come next for our main character, Lia, who, as a runaway and now kidnapped princess, is a hostage in a foreign country. Despite Lia’s situation, she was just as strong-willed and strong-hearted when it came to making decisions and staying alive in this book as she was in the first one. I love her compassion and how it’s shown in a way that doesn’t involve bloodshed for the opposing side. I think too many YA fantasy and dystopian book characters are too quick to solve problems with violence, and thankfully, Lia isn’t always one of them. Because one character’s story arc was a wee bit expected, I can’t say that the entire plot of the book was amazingly fantastic. I can say that it was pretty amazing though. The parts that I didn’t know were going to happen were epic! It’s just the smaller parts that had me like, “Oh, this trope is kinda familiar.” That’s not to say that Pearson didn’t put her own spin on the trope, however. But, despite all of this, I’m very excited to read the third book because of the huge cliffhanger this one left off on. All in all, The Heart of Betrayal is a great second book in an awesome fantasy trilogy. There’s a dedicated heroine, a broody assassin, a loyal prince, and a corrupt empire. What more could a reader ask for?